The DuxTel Commander System offers users high levels of control and flexibility in the deployment and administration of Internet access to meet a wide range of needs over a wide range of access technologies including wireless, cable, Satellite, 3G mobile, ADSL and even optical fiber. The power of the DuxTel Commander System comes from the technological strength, flexibility and cost effectiveness of the DuxAdmin backend administration system in combination with the DuxMaster internet gateway router. The DuxTel Commander centralised management and administration suite delivers automated configuration and device management. The system seamlessly handles and controls the operation of all units, the content displayed, user login and usage levels. It provides a detailed user analytics module that can provide a wide range of reports to enable detailed analysis of user activity. DuxTel services are delivered via servers hosted in our secure data centre facility. 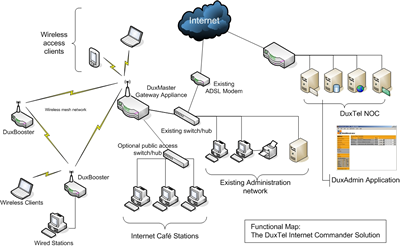 DuxMaster internet gateway - a plug-and-play device providing the internet access controls. 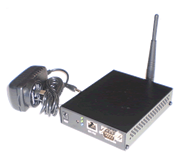 DuxBooster wireless network extender - add these to expand or extend network coverage. DuxAdmin internet services management suite - a sophisticated online application as easy to use as an internet web browser. Internet Hotspot Ticketing to sell internet access with pre-purchased tickets or online. Provide Internet Access by Wireless (WiFi) or traditional Internet Café model. Manage internet access accounts with flexible access plans and automated billing systems. Portable access ticketing to participate in syndicated access groups, or “go it alone”. Corporate management of access to the Internet by staff and other business users. Administrative user rights manager to create, manage and delegate control of the system. Manage Corporate VPN services to connect remote or branch offices together. The DuxMaster Gateway is the access controller hardware which provides routing and physical or wireless connections. The DuxAdmin backend system stores all of the user details and account information for each user, system plans and access profiles. The DuxMaster access controller communicates with the backend sending all login information and access usage data to the DuxAdmin system. the DuxAdmin system instructs the access controller which users to permit access and what session profile to use. All administrative and user interaction with the DuxTel Commander System is via the web based DuxAdmin backend solution. 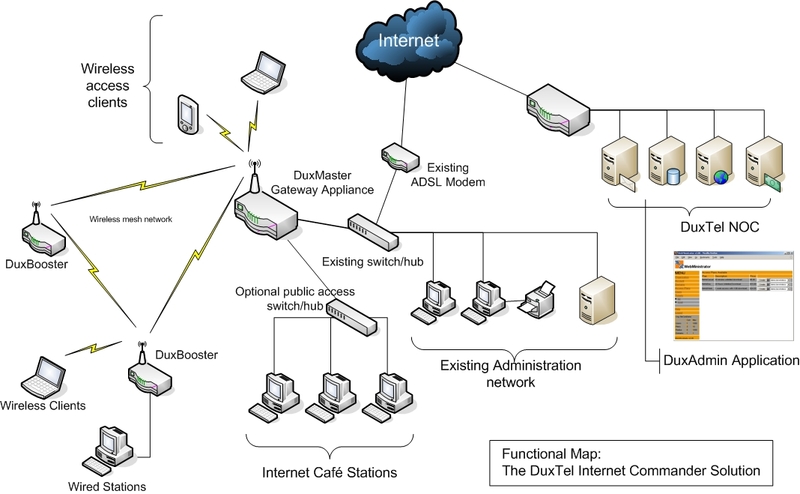 The DuxTel Commander solution is network technology agnostic. It will work equally well over wireless, as standard DSL-based copper technologies or even optic fibre networks. The benefit of operating on industry standard protocols means that the solution can be deployed using the optimum customer access network available at the intended site. Each DuxTel Internet Commander system requires at least one DuxAdmin access appliance, and a single DuxAdmin access account. The DuxMaster device provides the access management services and includes a high performance wireless access point (WiFi) base station. The built-in base station will provide coverage up to approximately 50m indoors, or 150m outdoors depending on the client device used. One or more DuxBooster devices may be added to the system to extend the wireless coverage, or to improve signal strength in particular areas. The DuxMaster and DuxBooster devices work together in a wireless mesh operating as a single functional network, and thus can also be used to bring wired (Ethernet) services to various locations without the need for traditional network cabling. The online administration application, DuxAdmin, can be accessed from any internet connected workstation at any location. The online application provides all the tools and functions required to manage and maintain the DuxTel Internet Commander Solution. Turns your internet services from a cost overhead to a profit centre – many business operations today treat internet services as just another cost overhead required to keep the modern business operating and efficient. This solution provides a means to treat your internet service as a resource for generating real revenue. Holistic Internet Administration System – the DuxTel Internet Commander solution provides a one-stop application to handle all your internet requirements, including email address and web site services. Grow as you need it – the innovative DuxMaster and DuxBooster combination allows you to start small and then grow as large as required. A simple solution requires only a single DuxMaster appliance, and then grow to include many DuxMaster units (e.g. one or two at each physical location) plus one or more DuxBooster devices to improve range and signal strength where needed. Take Control – now you can avoid potentially long delays waiting for your ISP to make changes to your web sites, email addresses, and passwords. The DuxAdmin application provides all the tools you need to deal with these tasks immediately and in real time. Look at some our case studies to learn how effective the DuxTel Solution can be. DuxTel Commander is Made for Mikrotik! 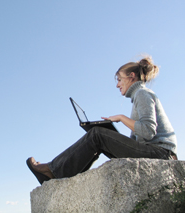 deliver managed internet services, anywhere!